This morning I have 3 polishes I was sent for review by the lovely Dolly from Dollish Polish. 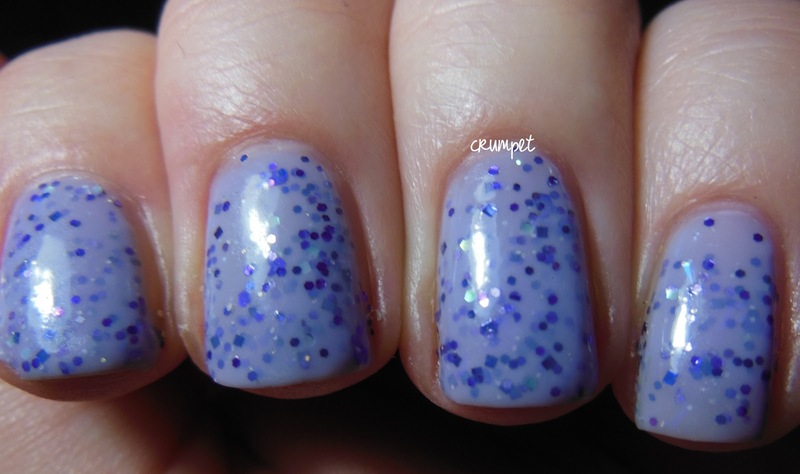 This brand has a special place in my heart, as it was the first indie brand I went overboard with, and Random Dancing, you may remember, was my favourite polish of last year. What I have found though is that over the last year, I have bought less and less of her polishes, and the polishes I was sent sum this up in a nutshell. Initially, Dolly made great glitter soups and toppers, a lot of them single-toned, or in a close colour group. However, as the year went on, she started becoming a bit bolder in her choices, and mixed clashing colours and also varying glitter shapes. 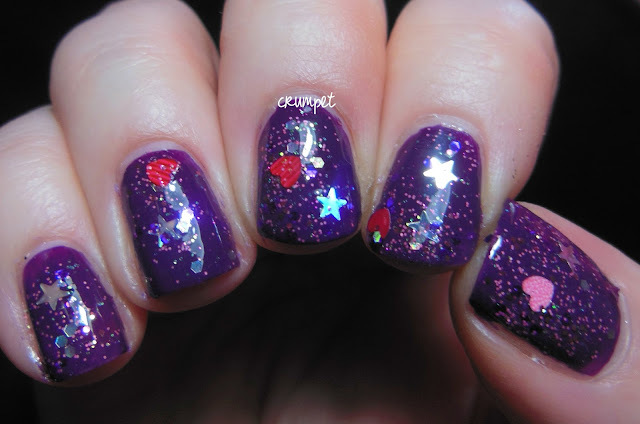 For me personally, this was where the polishes ceased to grab me - I'm not a fan of stars and hearts in my glitters, but I know a lot of people are. So today's post features one polish which for me is VINTAGE Dolly, one wild one that I actually quite like, and another that I just wouldn't buy. By happy accident, this post covers the Dolly spectrum. So, let's start with my true love from the 3 - Purple Rain. 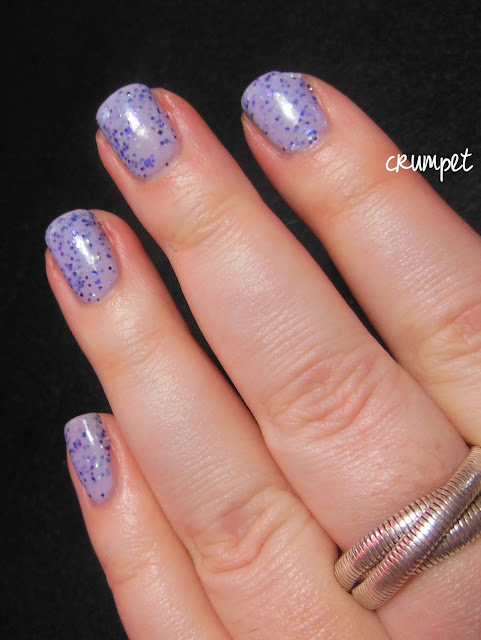 This is pretty much the perfect Crumpet polish - lilac, with purple glitter. I have a few of these types of polishes now, but this one is hands down my favourite. 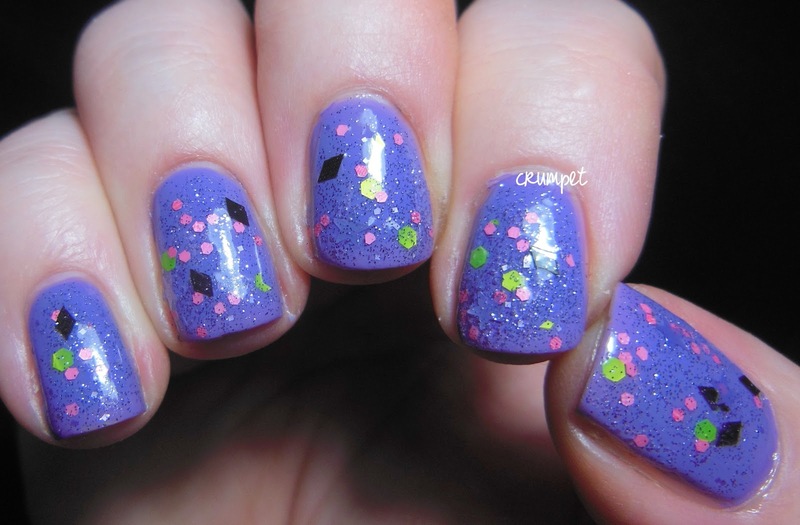 The mix of glitter is perfect - PURPLE SQUARES! - and there's just that hint of sparkle too. This applied perfectly and oh, I just couldn't stop staring. 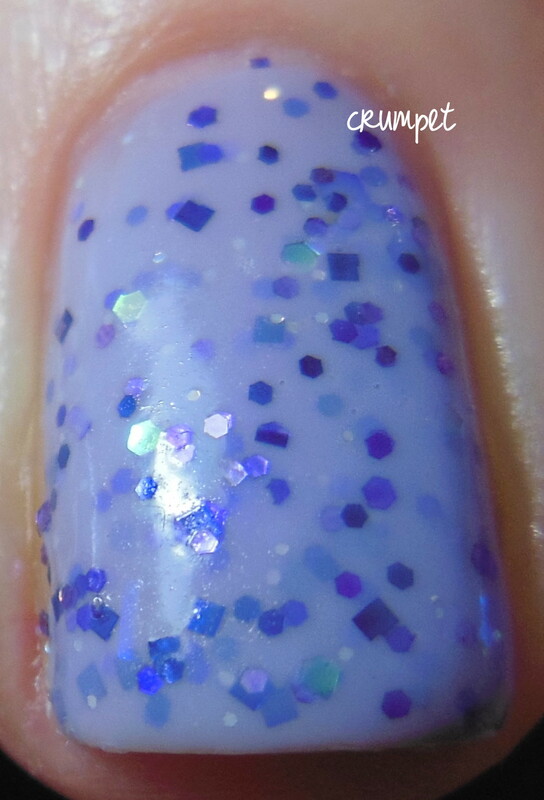 This for me is what I love about Dollish Polish, but from a composition perspective, this type of polish is rarer now in Dolly's line up. 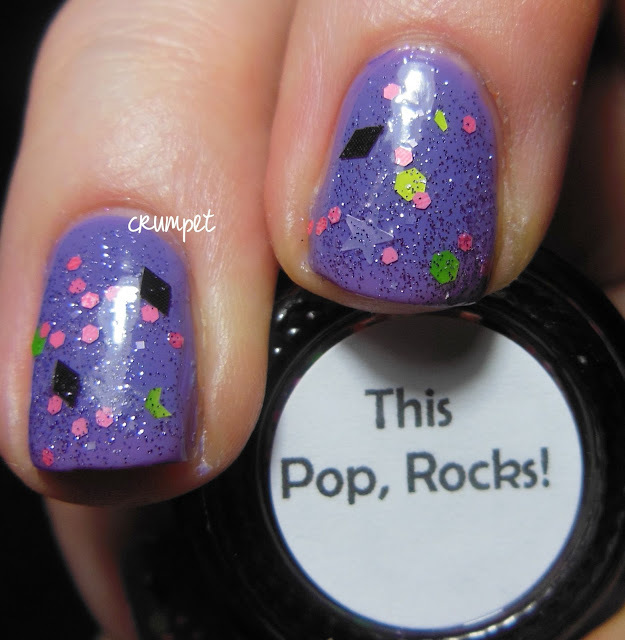 The next polish is This Pop, Rocks! and this really does represent the type of polish Dolly tends to create these days. 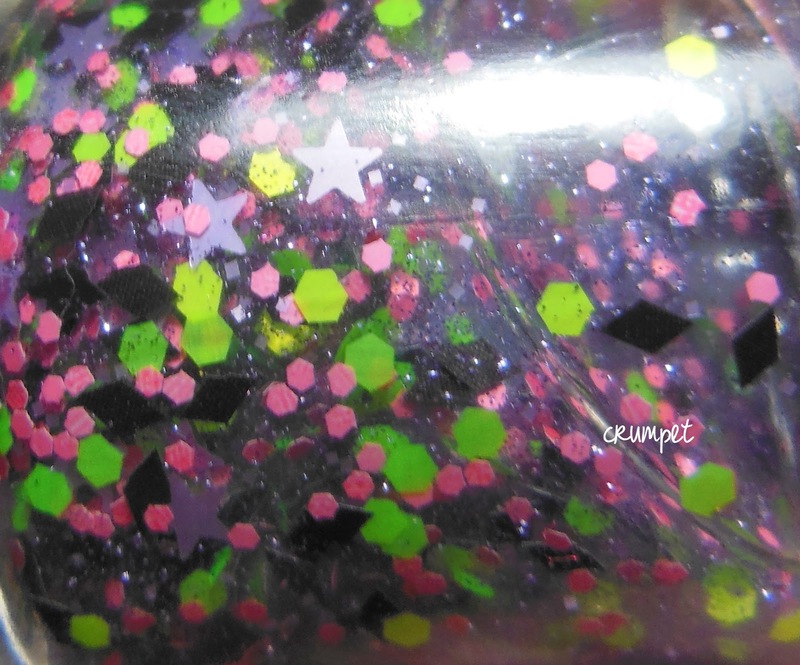 It's an acid mix of pink, green and black, suspended in a shimmery base. 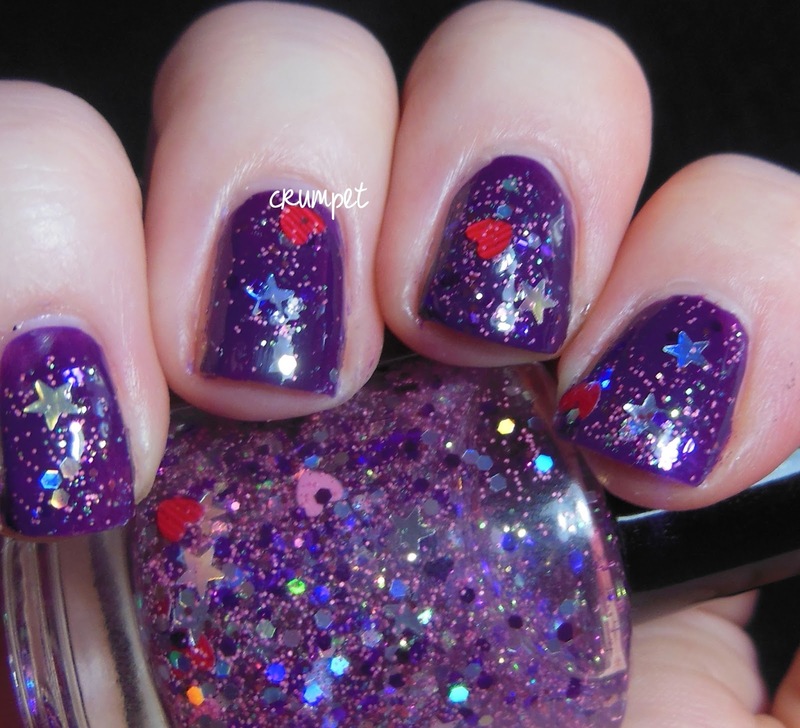 I layered this over OPI Planks A Lot, and the purple really helps the glitters pop. Ironically for such an "edgy" glitter mix, this looked perfectly springlike and pastelly. I did have some issues with this polish - I had some sinking glitters, so this needs a gooooood shake before you apply it. I also had some mild staining when I took it off, in the places where the larger glitters sat. I know from personal experience how vigilant Dolly is with her testing, so I think this was probably more likely to be because I used a PVA base. And finally, the one that's not me! 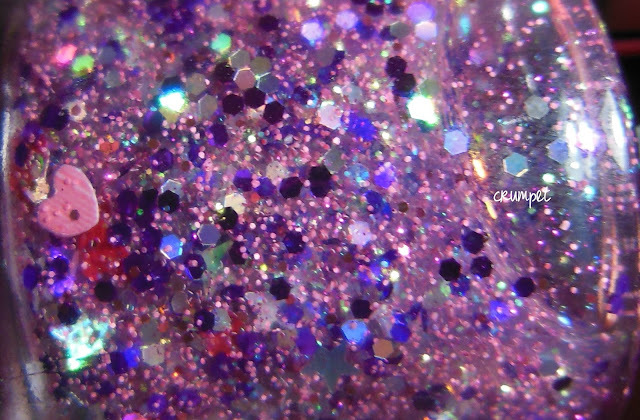 That's So Fetch is a pink shimmery glitter puddle, blasted with stars. 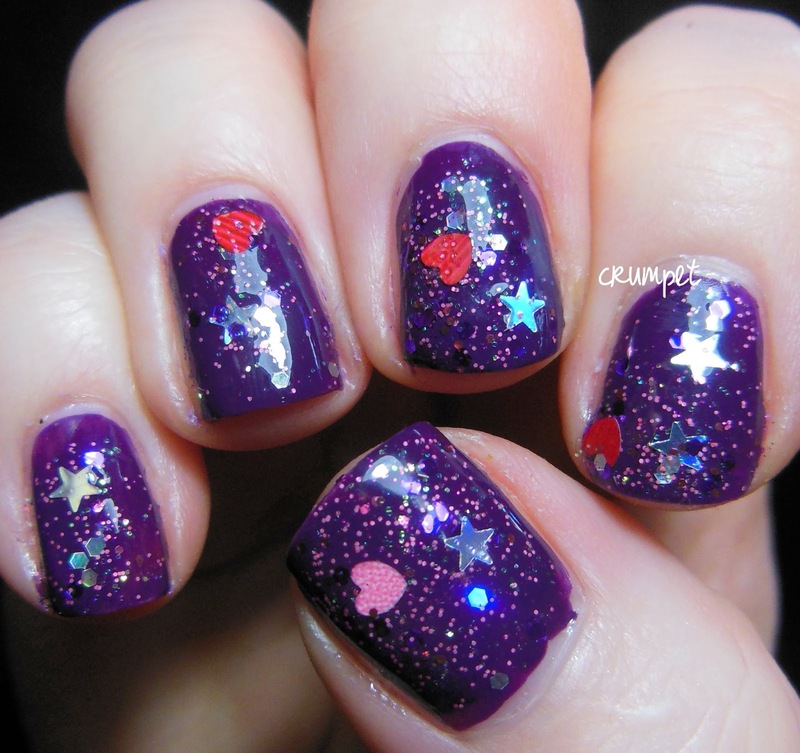 I layered this over Barry M Blackberry. I actually think this combo looks great together, but I personally ... argh, I don't know what it is, I just don't like shaped glitter. That makes me sound so boring!! I really had to fish for the bigger glitters in this one, but they were relatively easy to grab. I think the hearts in particular were slightly heavier, which made them more prone to sinking. 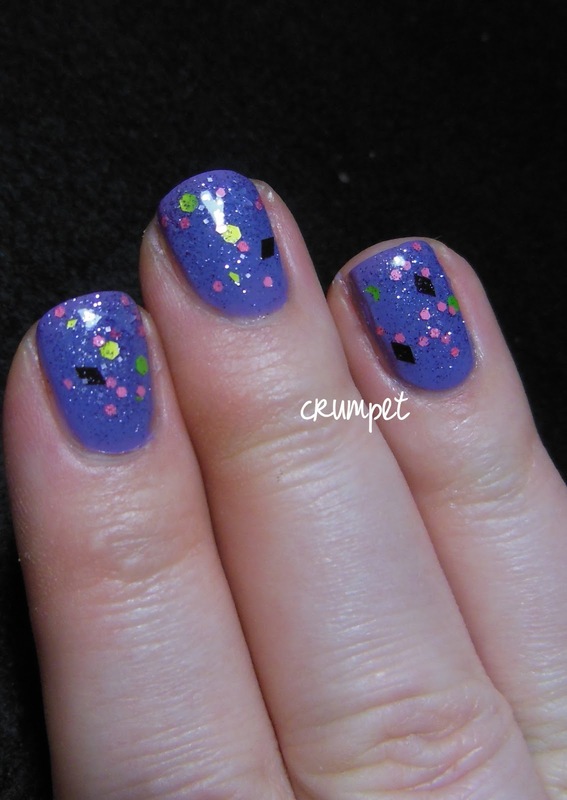 So, which type of Dollish Polish is your favourite? 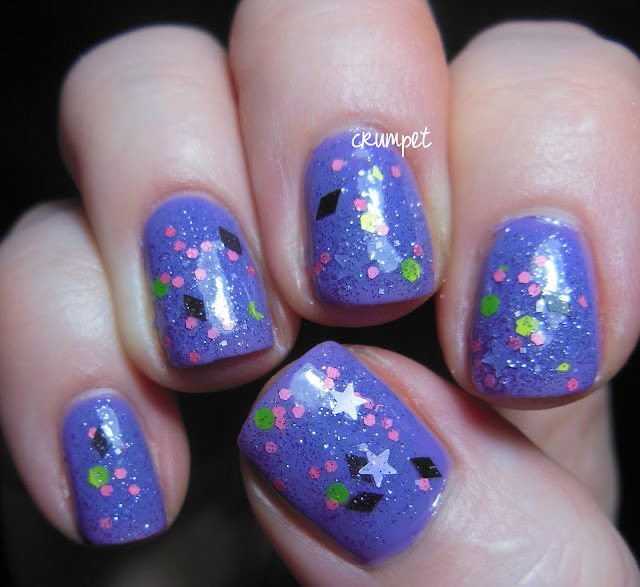 Do you like the older, more simple polishes, or the newer, zanier and more eccentric ones? You can check out my favourite Dollishes in Indie Corner, just below my header. As you've gathered, these polishes were sent for me for my honest review, and it really was a dream come true for my first Indie love to send me some babies. Total fangirl moment !! Ha ha. 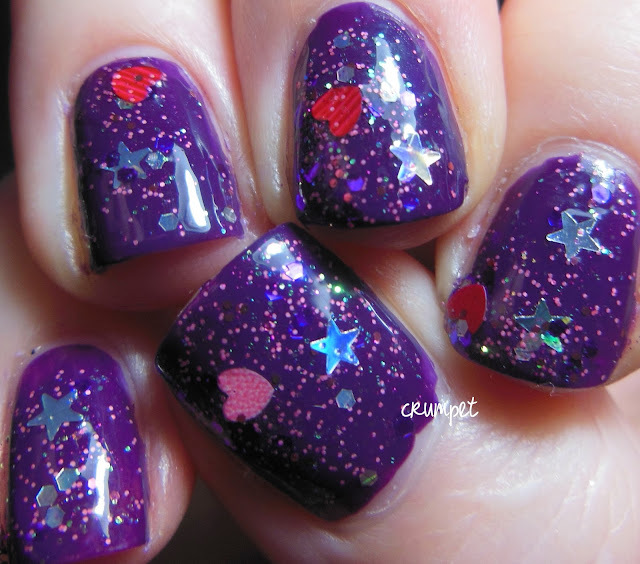 You can buy Dollish Polish at her store HERE and visit her on Facebook HERE.